Do you get sick and tired of fidgeting with those skinny little cardboard cozies you get with your coffee? Do you wish there was an easier more efficient, more environmentaly friendly way to keep your coffee warm and keep your hands from burning? Well Moustache March has the solution for you! Our all new red or blue can cozies are the best thing for your coffee/latte/mocha/other drinks I can’t even pronounce. 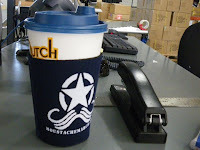 One of our own fans who drinks more Dutch Bros than you could shake a stick at came up with this great solution. Now you too can keep your drinks 72% warmer*, 43% longer* and keep your hands 84% cooler* all while looking 100 cooler* and saving 20 acres* of koala inhabited rain forest per year. All while supporting the best month of the year and the best facial hair ever, year round. Now available at the Moustache March Store for only 5 bucks!